Liquor stores are filled with gift sets and specials for holiday gifting. Champagnes packaged with flutes, Cognacs with snifters, tasting kits (a box of smaller bottles of different expressions), “keeper” bottles with holiday designs and limited editions (Absolut Electrik, anyone?) all vie for your attention. We received scores of pitches, but here’s what caught our eye (in alphabetical order). You may or may not know that Sean “Diddy” Combs is the co-owner of the DeLeón tequila brand, which he acquired along with Diageo, his partner in Ciroc vodka. 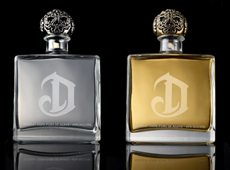 Bottles of DeLeón Platinum ($55) and DeLeón Reposado ($65) can be custom-engraved with your personal message. It is engraved on the back of the bottle facing the front, so it can be seen whenever the giftee looks at the bottle. You have 10-25 characters on two lines in 14 point type, or 10-30 characters on 3 lines in 10 point type. Each bottle comes beautifully wrapped and accompanied with custom drink stirrers and a personal note from Mr. Combs. Start composing those messages, then head to ReserveBar.com. TOP PHOTO: Engrave a message on the back of the DeLeón tequila bottle. 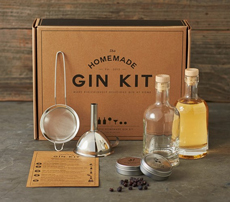 BOTTOM PHOTO: Make homemade gin with this kit from DIY. And homemade tonic water, too. How much fun is this? The Homemade Gin Kit (photo above) lets you transform a generic bottle of vodka into your very own home-blend of gin in 36 hours. The kit contains everything you need—except the vodka—to make a like craft distillery-like gin in just 36 hours. It’s $54.95 at Williams-Sonoma.com (online only). You can combine it with a DIY Tonic Water Kit, $24.95. Utopias, beer aged to a cognac-like state. 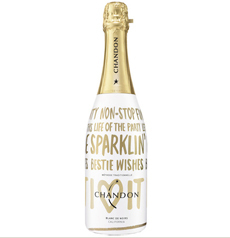 Celebrating its third year of limited-edition holiday bottles, the 2015 bottle is white with gold script phrases like “Nonstop Fun” and Bestie Wishes.” It’s available at retailers nationwide, or online from Chandon.com. The suggested retail price is $24 for a 750-ml. bottle, $288 for a case. Not grand enough? For $449 you can give a Dom Pérignon 3-Pack: three bottles of the The King of Champagne’s 2005 vintage, with an engraved glass ice bucket. Jose Cuervo has released two limited edition tequila bottlings of Especial and Reserva de la Familia. They commemorate “the pivotal role that Jose Cuervo played in fueling The Rolling Stones notorious 1972 North American tour” (dubbed the “Tequila Sunrise Tour”). For those who don’t know their Stones legends, the tour kicked off with a party at The Trident bar in San Francisco. According to an article in National Geographic, Mick came up to the bar and asked Bobby Lozoff, inventor of the Tequila Sunrise,for a Margarita. Bobby suggested a Tequila Sunrise instead and the rest, as they say, is history. Both bottles feature the iconic Stones “lapping tongue” logo and a limited-edition label. The Special Edition Rolling Stones Jose Cuervo Especial has a suggested retail price of $16.99. The Ultra Premium Rolling Stones Reserva de la Familia Collectors Edition—the private Extra Añejo tequila reserve of the Cuervo Family—has a suggested retail price of $149.99. What’s a $200 Samuel Adams like? It’s a rich, uncarbonated beer aged in wood barrels, known for its extraordinary flavor profile. Like cognac, it’s is a blend of previous vintages. The complex aroma has notes of wood, toffee, cocoa, raisin and maple; on the palate there’s molasses, earthy wood, dates, and toffee. 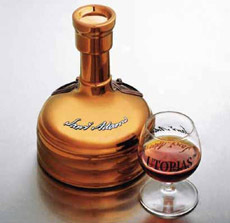 Utopias a limited edition, limited release brew. Only 15,000 bottles are made each year. It’s packaged in a ceramic brew-kettle-style decanter. This year’s batch is 28% ABV, and is best enjoyed at room temperature, as a two ounce pour in a snifter. At a suggested retail price of $199, you probably can’t give it as a gift to all your beer-loving friends; but connoisseurs of craft beer will really appreciate a taste. Buy a bottle and invite them for a sip.